Putting together one ultimate tourist-friendly itinerary around Kiev’s main sights is virtually impossible. 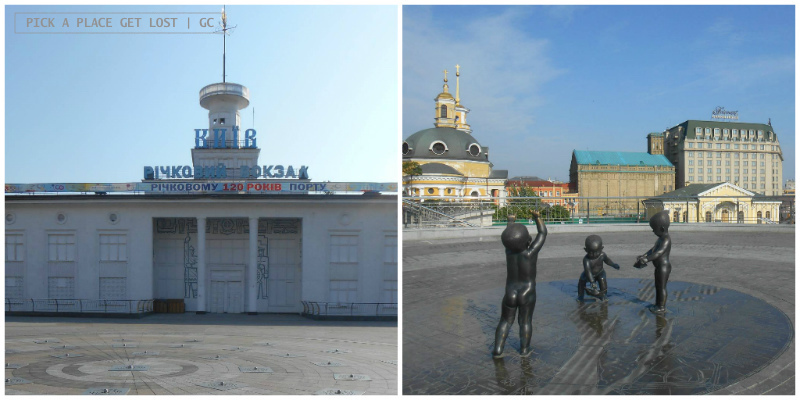 Kiev is huge, and it takes time to get to know it and explore its multi-faceted urban landscape. In my previous Kiev post I briefly mentioned Khreshchatyk (Хрещатик) only to say that it cuts right through Maidan. In fact, this broad, 1.2-km street that stretches from European Square (Європейська площа) to Bessarabska Square happens to be a popular tourist attraction and shopping street, as well as an important business and administrative centre. Razed to the ground during World War II, it was rebuilt in compliance with the principles of Stalinist architecture. Today it is lined up by restaurants, cafes, fancy shops, the Central Department Store TsUM (ЦУМ), music and art venues, administrative buildings, while the elegant yellow building in Bessarabska Square is the indoor market by the same name (Бесарабский ринок). Well, this one’s another classic, both by name and in fact. Taras Shevchenko is considered a true national hero: he was poet, writer, artist, political figure… well, you see my point. Most importantly, he is acknowledged as the founder of modern Ukrainian literature and language. Unsurprisingly, Shevchenko is a leitmotiv everywhere in the street that bears his name (бульвар Тараса Шевченка) – or the city, for that matter. The first part of the street is also known as the alley of poplars. At its very beginning sits the empty pedestal where once stood a statue of Lenin. The sculpture was repeatedly vandalised over the course of the years till, in December 2013, it was torn down by demonstrators as part of the Euromaidan events. Shortly after the statue had been toppled down, a golden toilet was briefly placed on top. The pedestal is now partly wrapped in flags and stickers, its base painted with the colours of the Ukrainian flag. As for the golden toilet, it is long gone, and on top of the podium stands an iron trident that represents the coat of arms of Ukraine. 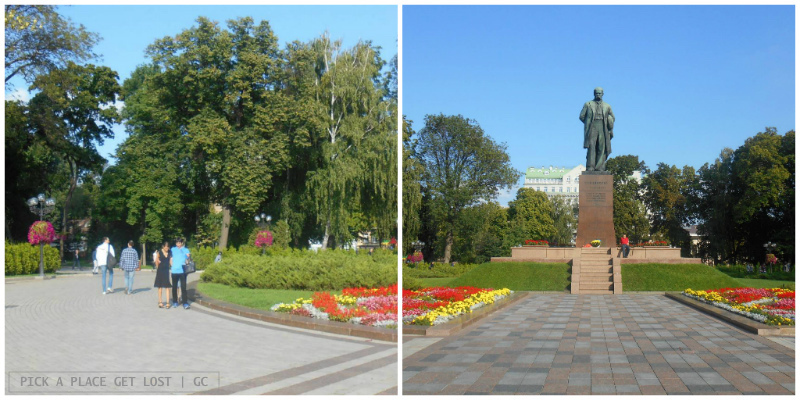 Other key spots on the boulevard are Taras Shevchenko park and Taras Shevchenko University. 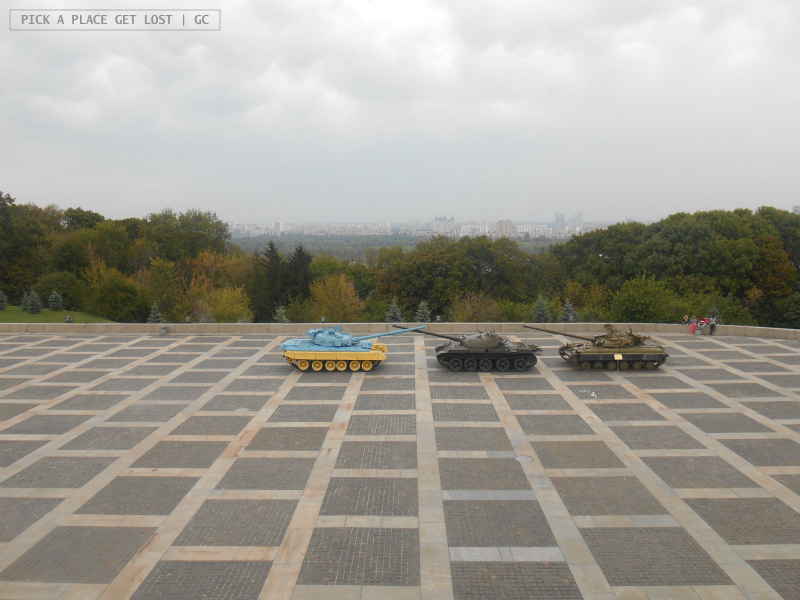 These are respectively Kiev’s main city park and central university. The park (Парк імені Тараса Шевченка) is all green areas, footpaths lined up by the comfiest benches (which you absolutely want to try yourselves! ), and colourful flowerbeds surrounding a bronze statue of, guess who? Taras Shevchenko, obviously. The university is known as Kiev National University (Київський національний універcитет) and has several venues, but the one across the street from the park is the oldest and main building. It hardly goes unnoticed because, well, it’s all painted red but for the heads and bases of the columns, which are painted black. 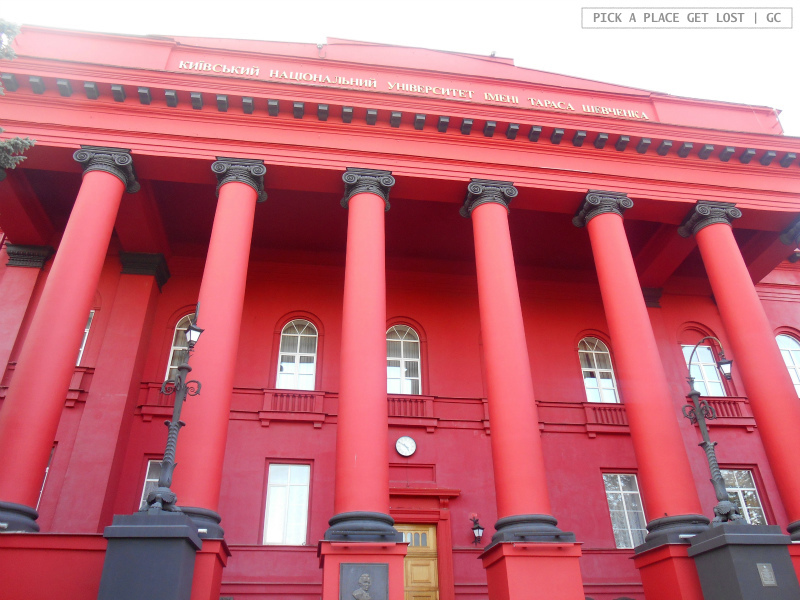 Fun fact: red and black are the colours of the Order of Saint Vladimir, whose name the university used to bear. 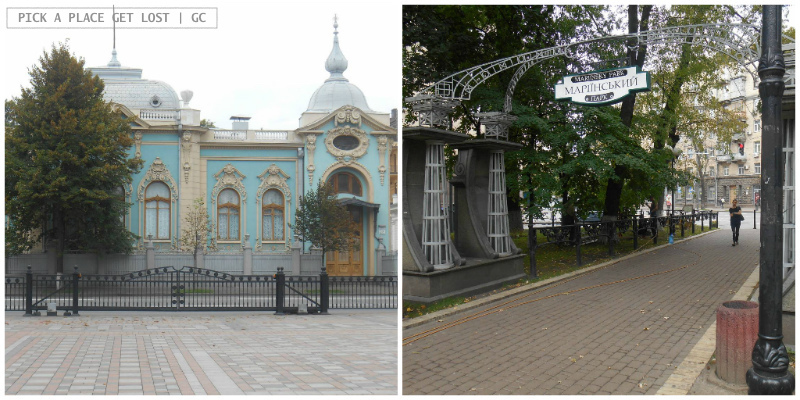 Last but not least, the Taras Shevchenko National Museum is located on the street, across the street from the park. The history of the Golden Gate (Золотi ворота) goes hand in hand with the history of the city and its urban development. The original structure dates back to 1037, and was part of the city’s fortification: it was the main entrance to the city. It was last reconstructed in the late 20th century. The gate stands in the heart of a small park, and its half-brick half-wood appearance strikes quite a contrast with the sea of tall concrete buildings prevailing in the area. Too bad the current appearance of the gate is entirely arbitrary. Since no images of the original structure have survived, no one knows what it actually looked like. Several proposals were submitted for the new gate project, but the decision itself to reconstruct it was highly controversial. Remember St. Andrew’s Church, the big, velvet-roofed white-and-green church at the top of Andriivskyi descent (Андріївський узвіз)? 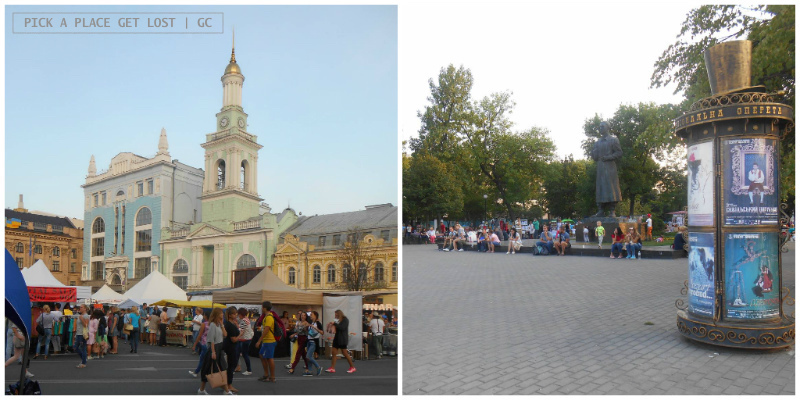 Okay, walk down Andriivskyi descent from the church, and at the bottom of the street you will find yourself in Contract Square (Контрактова площа). Contract Square is the oldest square in Kiev, and it’s one of the most authentic, liveliest spots I’ve seen in the Ukrainian capital. At night (when we first crossed the square in search of our hostel) it was crowded with young people hanging out and listening to music, and it had a super vibrant feel to it. A couple of days later, when we crossed through it just after we got back from Chernobyl, it was lively and loud, equally populated by tourists and locals browsing the stalls of whatever street fair was on, or simply basking in the late afternoon sun. 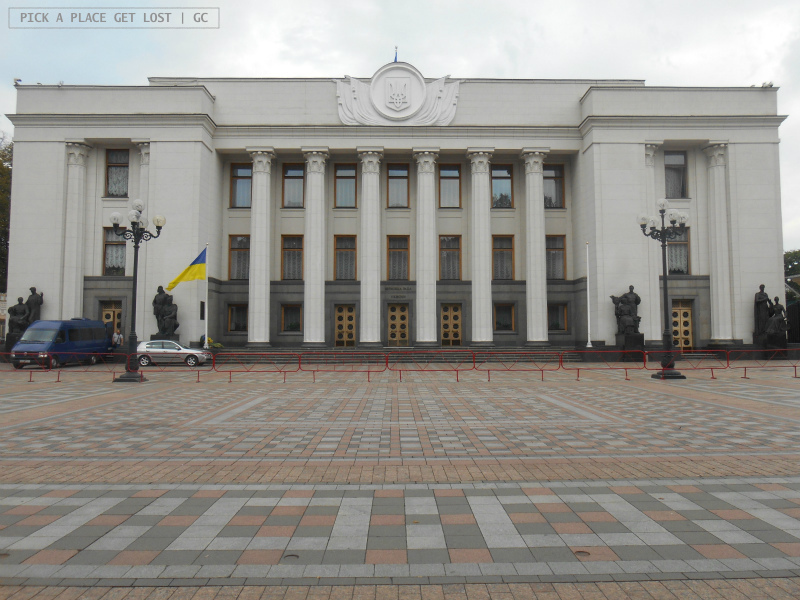 The square owes its name to its relative proximity to the river port, where trade deals (kontrakty in Ukrainian) were held on a regular basis. The concentration of cultural highlights on the square is very high. On one side you’ve got Pyrohoshcha Dormition Church (Церква Успіння Богородиці Пирогощої) and the Church of St. Catherine. The former is the pinkish building with the round cylinder-shaped dome. It is Kiev’s oldest church: it originally dates back to the 12th century, though it underwent significant reconstructions over the course of the centuries. The latter is the white-and-green building with the small golden-domed bell tower. It’s a former Greek Orthodox church, but it’s too small to stand out in the large square. I personally find more impressive the white-and-blue building right next to it (home to the General Directorate of the National Bank of Ukraine). 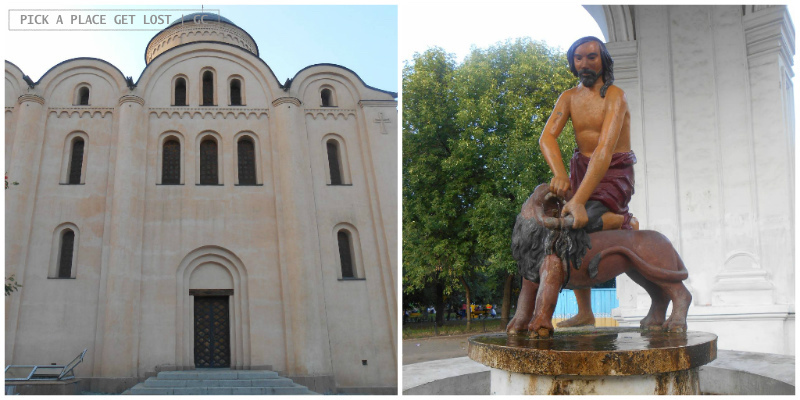 Other noteworthy monuments in the square include the equestrian statue of Petro Sagaidachnyi and the monument to philosopher Hryhorii Scovoroda. Last but not least, there’s a fountain shaped like a small, classical temple with a wooden statue of Samson. First erected in the 17th century, the structure was destroyed by the Bolsheviks in the 1930s and re-installed in the square in 1981. The Samson sculpture, though, survived destruction, so what you see is the original – and, yes, it does look a bit tacky, if you ask me. 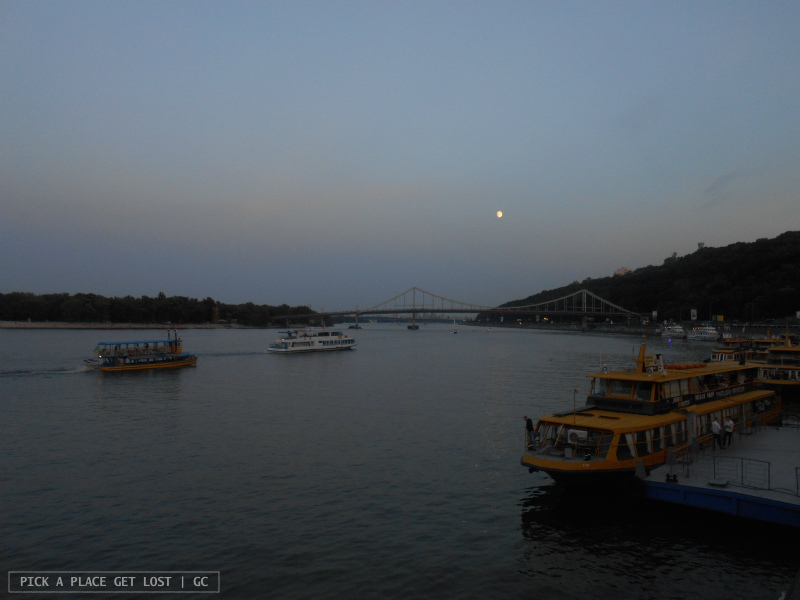 It would be a shame to miss out on this one, as Kiev’s main river port (Київский рiчковий порт) makes for the perfect break from the ‘conventional’ sightseeing. Conveniently located near Pochtovaya ploshchad metro stop, its imposing, yet elegant white structure (the passenger terminal) hardly goes unnoticed. One side of the building overlooks an always busy multi-lane road, but the other looks out directly on the Dnieper and, right next to it, a large square that goes from pleasantly silent and deserted (in the earlyish morning) to crowded with locals and tourists (at all other times of the day). Partly that’s because the port area includes a few nice bars and restaurants with a view, but mostly that’s because of the view itself, which is really quite spectacular. Walk down the stairs to the pedestrian promenade, and you will see what I mean. As you stand by the iron railing, you have the city skyline and the Podilsko-Voskresensky Bridge on your left, and the (hardly mistakable) Parkovy Pedestrian Bridge on your right. 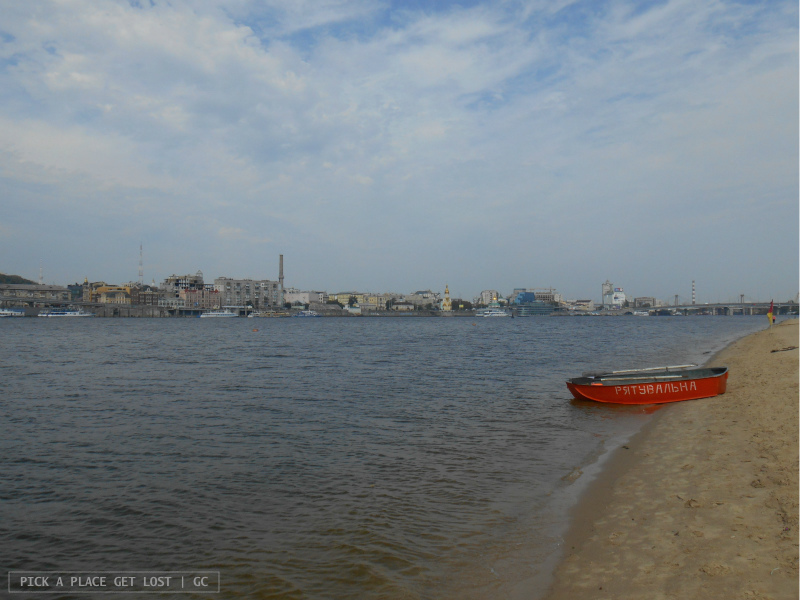 If the river port makes for a nice break from the ‘conventional’ urban sightseeing, Trukhaniv Island (Труханів острів) is a perfect ‘getaway from the city in the city’. 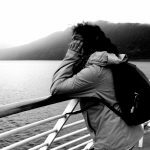 It’s ridiculously easy to reach, and you can spend as much time as you like around the island, from a few hours to a whole day. You can get there by crossing the pedestrian bridge I mentioned in entry no. 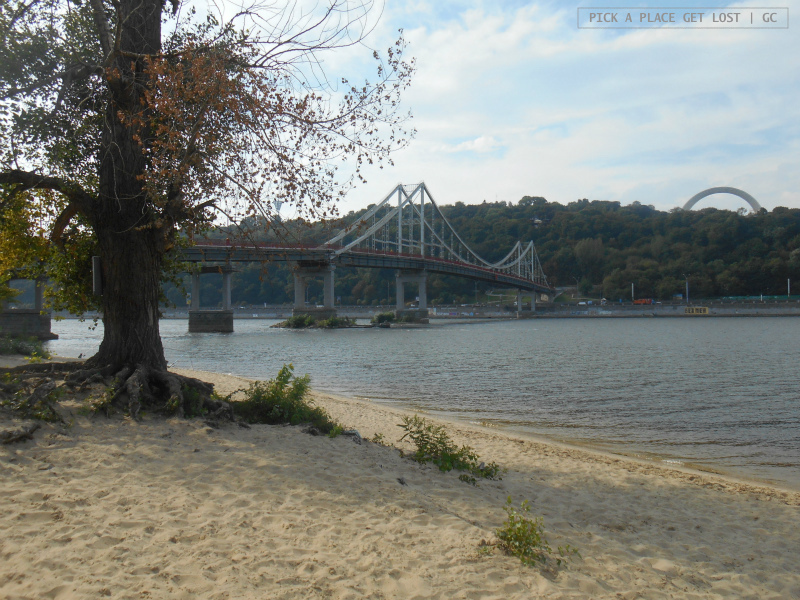 5 – which bridge is accessible from the wooded area behind the Friendship of Nations Arch (see next entry). Crossing the bridge is quite an experience itself: the river is spectacular from there. We only had time to walk a tiny stretch of beach, but the island is much larger than that. In fact, it also includes hotels and cottages, a waterpark, camps and sports clubs, and a few other attractions here and there. We were there quite early on a Monday morning, and the shore was empty and silent. It was the perfect day for a walk on the beach: sunny, breezy and warm. On average, though, it is much more crowded, especially at weekends, in the summer and, thanks to its bars, clubs and cafes, at night. The island was neglected for years, but since 2013 Kiev authorities have been gradually but steadily making the most of its exceptionally high potential. The Friendship of Nations Arch is one of those monuments that end up in your field of vision (and your photographs) quite regularly but unexpectedly. 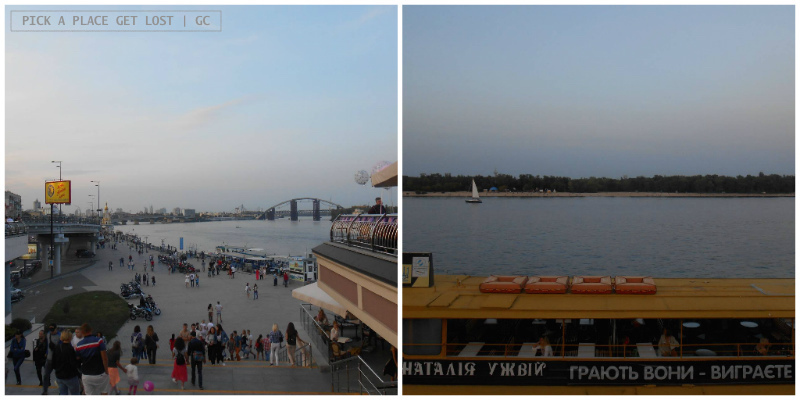 If you’re standing by the Dnieper at the river port (see entry no. 5), it’s the silver arch that sticks out from the thick vegetation just above the pedestrian bridge. If you’re on the river shore on Trukhaniv Island, look at the view across the Dnieper… Yes, still there, with its unmistakable profile. 2. At the end of Kreshchatyk Street, and behind European Square. The monument is and looks like a huge rainbow of steel. Like the Golden Gate (see entry no. 3), it was unveiled in 1982 to celebrate the 1500th anniversary of the city, the unification of Russia and Ukraine in 1653, and the 60th anniversary of the USSR. 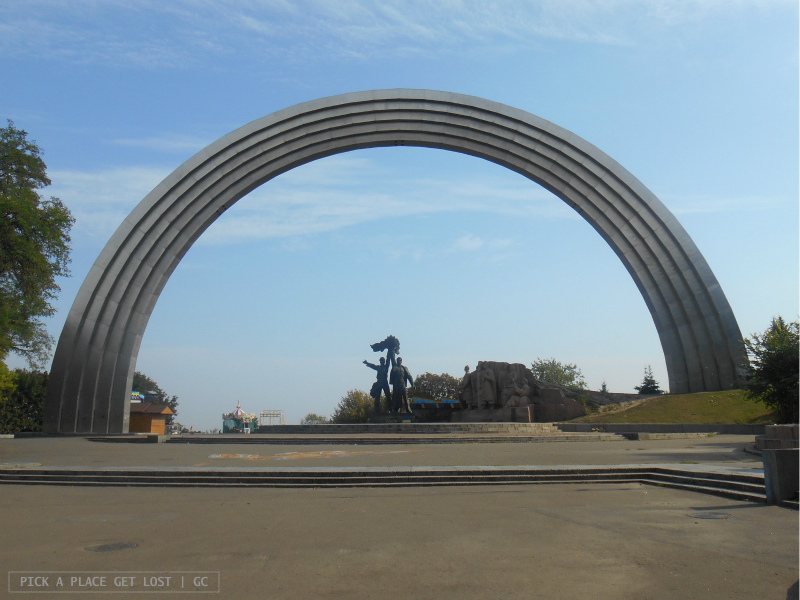 Though the arch is its most characteristic element, the monument also includes two sculptures. 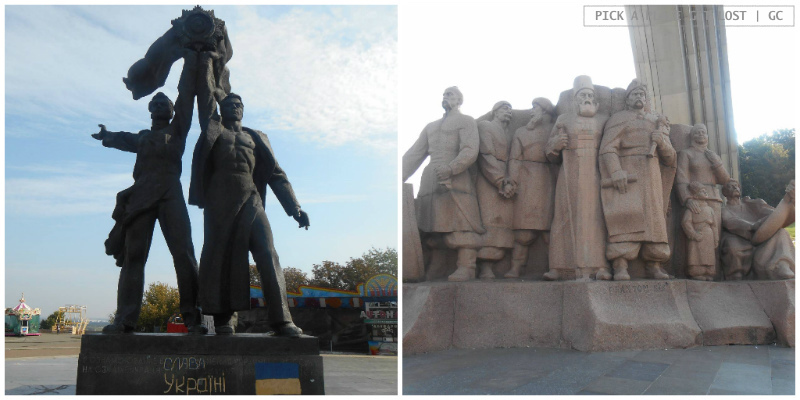 One is a monumental bronze statue that portrays a Russian and a Ukrainian soldiers. They are holding up the Order of Friendship of Peoples, a Soviet order awarded to those who achieved especially remarkable accomplishments. Incidentally, the inscription at the base of the monument is now barely readable, half-covered by the colours of the Ukrainian flag and the words ‘Glory to Ukraine’ (Слава Украïнi). 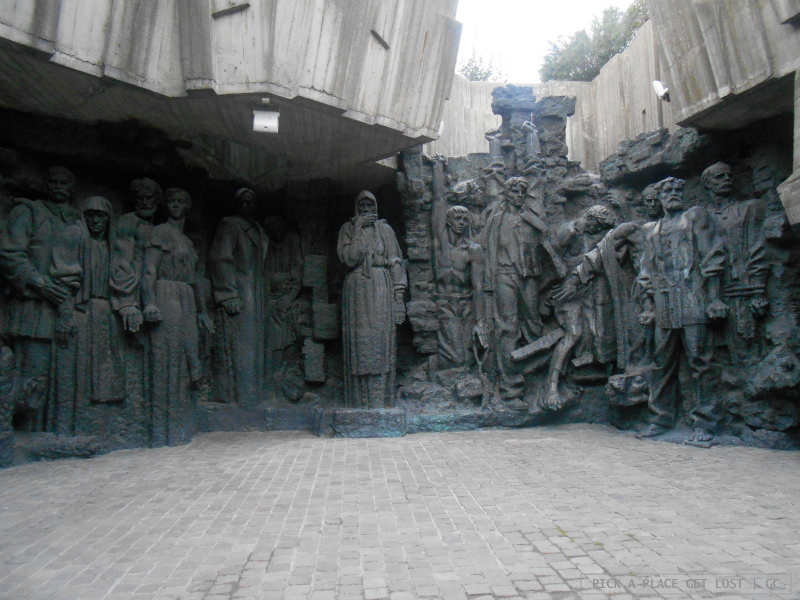 The other element is a granite sculpture (also monumental), which depicts the participants in the 1654 Pereyaslav Council. Almost forgot to say: the view of the river from up there is amazing! Hrushevskyi Street (вулиця Михайла Грушевського) is a long, broad street in central Kiev that goes from European Square to Arsenalna metro station. 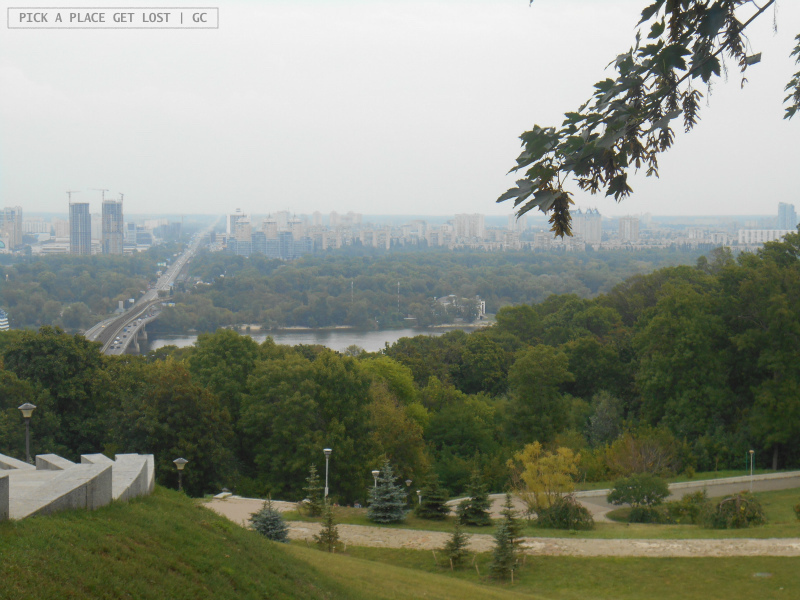 If you’re visiting Kiev, you will most likely go for a walk down there. The street is lined up by buildings of historical, institutional and cultural importance – which might considerably slow you down, as it means stopping at staring at virtually regular intervals, but for all the right reasons. 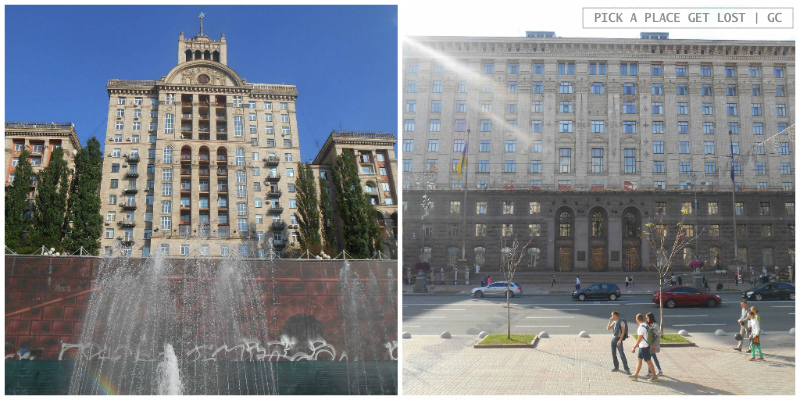 – a number of modernist buildings that look like architectural ‘bubbles’ where time stopped a long time ago, notably Salute Hotel (Салют) and Kiev Hotel (Куïв). 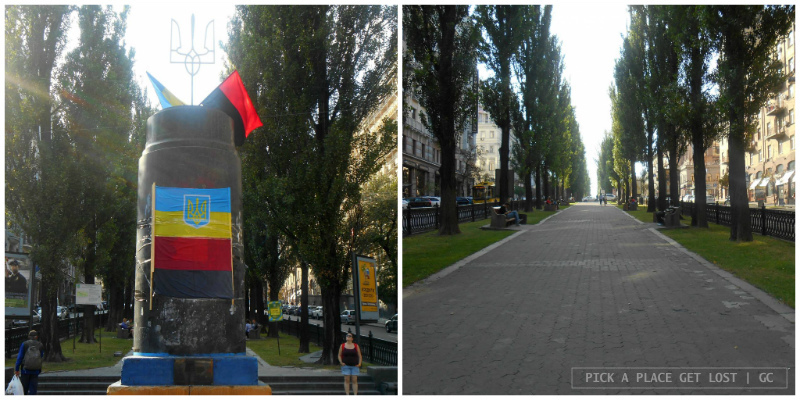 Hrushevskyi changes into Ivan Mazepa Street, but you want to keep going till you reach the entrance to the Park of Eternal Glory (Парк Вічної Слави), marked by Ukrainian flags and the ‘1941 – 1945’ inscription*. 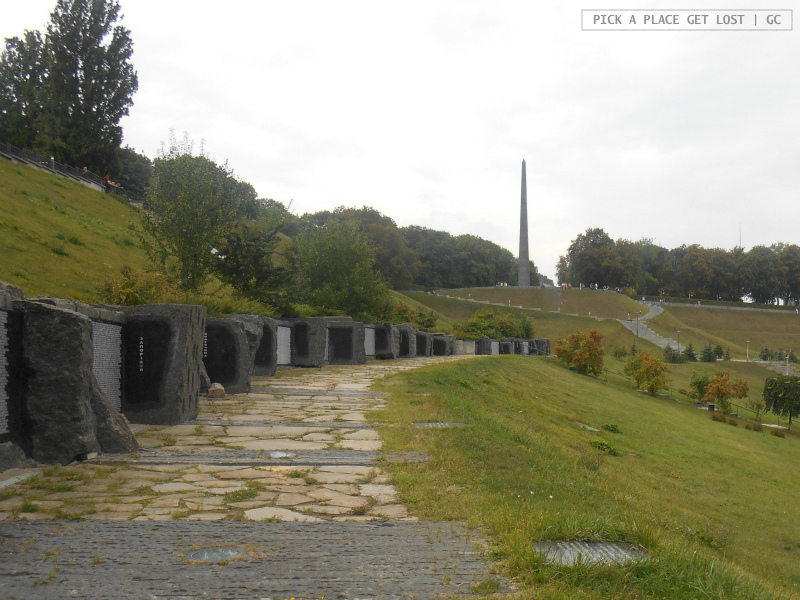 The park is in fact a large memorial complex sitting on a hillslope overlooking the Dnieper. It was built to commemorate the soldiers that died during World War II and, well, it objectively serves its purpose very well. 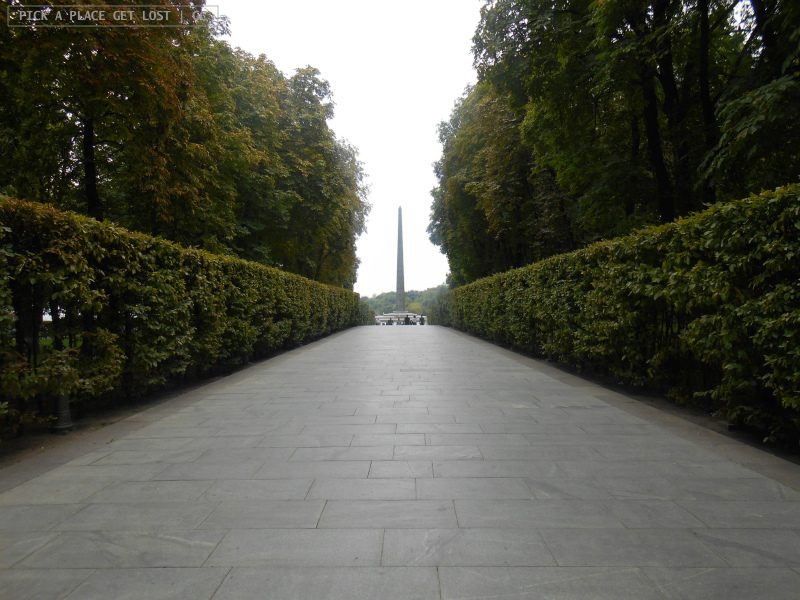 The main footpath leads up to the Glory Monument, a tall obelisk with the grave of the Unknown Soldier and the Eternal Flame at its bottom. The view from the obelisk site is quite stunning, especially if you’re there on a sunny, bright day. By the time we reached the park, the sky had dramatically clouded over, and the late summer sultriness and humidity projected the view of a misty, post-industrial Kiev in the distance. Walk past the obelisk and follow the path downhill. 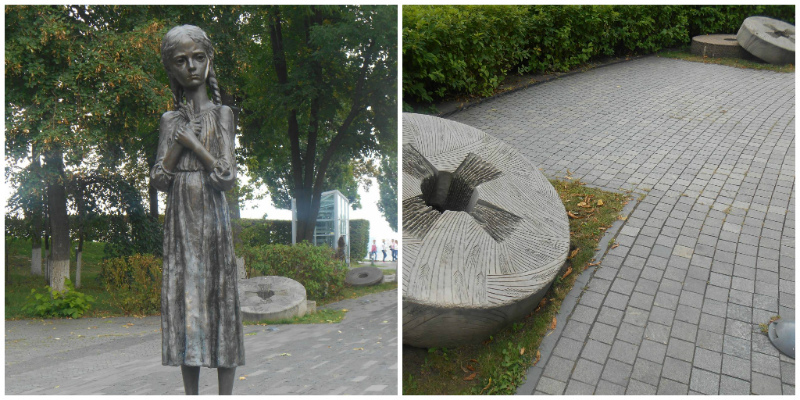 It will take you to the actual beating heart of the park: the National Museum ‘Holodomor Victims Memorial’. Opened in 2008 by initiative of then president Yushchenko, the museum commemorates the millions of people perished in the famine that hit Ukraine between the winter and early spring of 1932-33 – which famine is mostly recognised as a genocide caused by the Soviet regime of Joseph Stalin. The museum building is marked by a candle-shaped tower, the Candle of Memory memorial. The visit is intense, especially because of the videos projected on the walls, which tell the story of those endless, painful months. Large books list the names of (some of) the victims that have been identified. Farming tools, equipment and everyday objects from the old days are also on display. On one side of the candle-shaped tower there’s a monument in the square, ‘The Bitter Memory of Childhood’. The statue of the black-eyed little girl in the middle is the (skinny) embodiment of the tragedy: the painful hopelessness on her face is haunting. On the opposite side of the museum building, along the footpath on the hillslope, there’s a long row of black stones. That’s Blackboard Alley, where large stone slabs tell the names of the Ukrainian towns and villages affected by the famine (around 14,000). 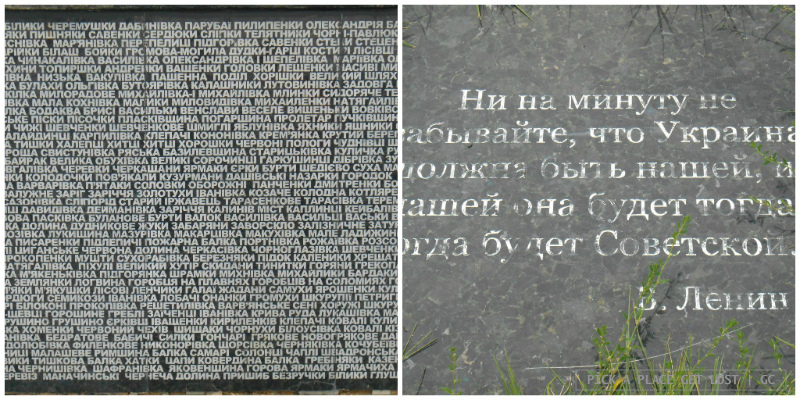 Stone plates on the ground quote the words of Bolshevik leaders on how to tackle and solve the ‘Ukrainian issue’ (i.e. suppress any attempt at independence). Everywhere the symbolism is palpable and, here and there, harrowing. The Park of Eternal Glory is adjacent to the Lavra, which we reached soon after we left the park. I feel like I’ve already written extensively on the subject in the Kiev post about churches, though, so I won’t be dwelling on it any further. 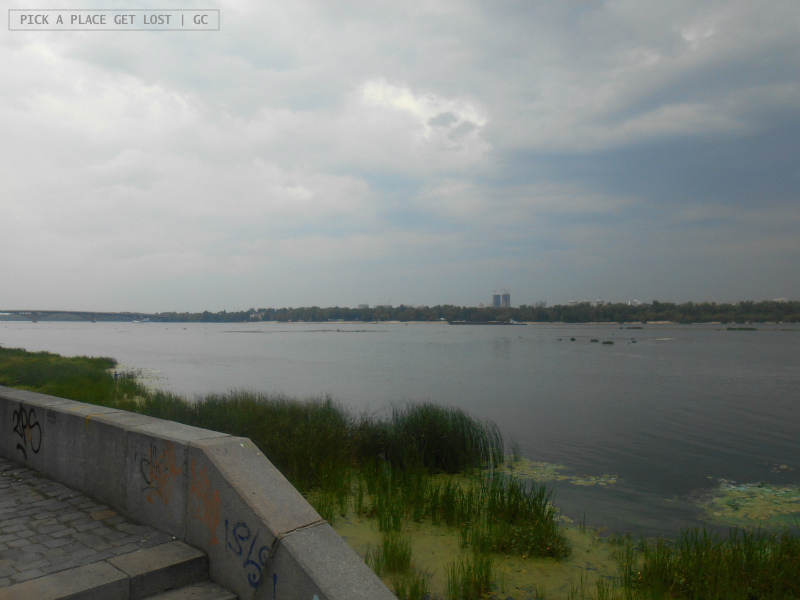 I did mention that, once we found a way out of the Lavra complex, we found ourselves near the river. Now, from there walk down the path that runs parallel to the main road (Naberezhne Hwy) till you see the monument on the opposite side. There’s an underpass at some point, if you want to get close to it (crossing the street is not a good idea, as the cars drive quite fast there). The monument is quite impressive, also thanks to its scenic location on a platform on the river bank, in front of a colourful flowerbed. The sculpture complex was built in 1982 in the heart of Navodnytsky Park. 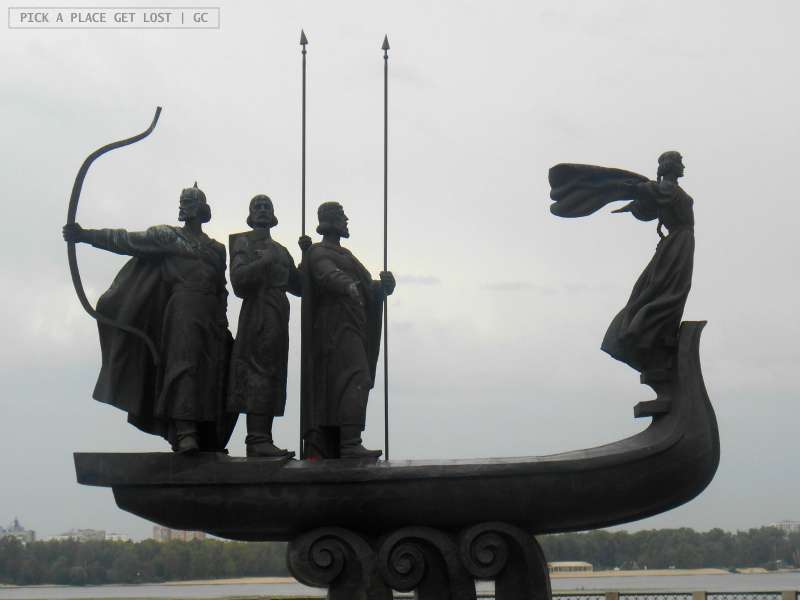 It depicts a boat carrying the four legendary siblings (three brothers and a sister) that founded the Medieval Kiev. The three brothers (Kyi, Schek and Khoriv) stand in the middle of the boat, bow or spear in hand, while the sister (Lybid) fiercely stands at the prow with her arms stretched out wide. ‘Fun’ fact: in early 2010 the monument couldn’t stand the frost, and a portion of the boat (and two of the brothers) collapsed. As it turned out, the accident was (partly?) caused by structural flaws in the original construction process. The monument was reopened three months later. 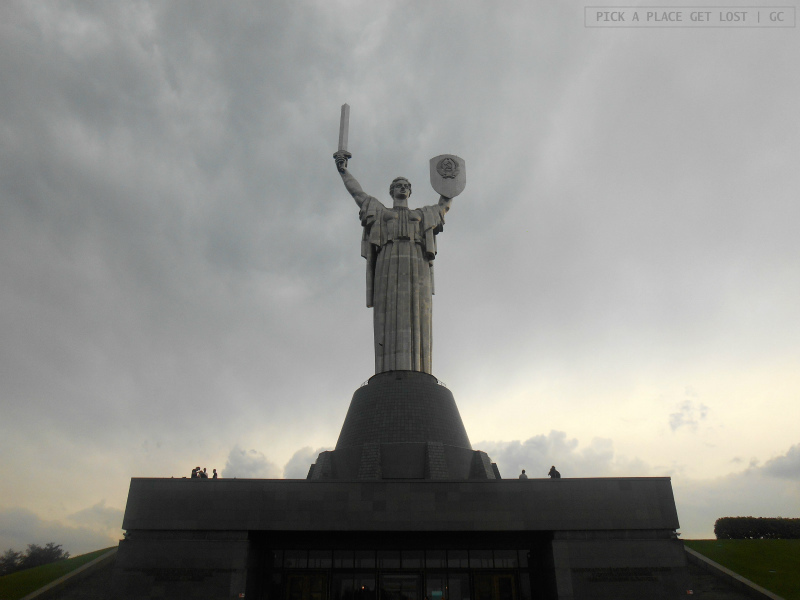 We spotted the statue of the Motherland Monument (Батьківщина-Мати) at least twice before we actually reached the monument site – which, incidentally, was also the very last entry on our Kiev to-do list. The first time we saw it in the distance from the Lavra complex – we were still at the point where we (still) enjoyed all the wandering about, and couldn’t fathom we’d soon get lost and struggle to find a way out of there. 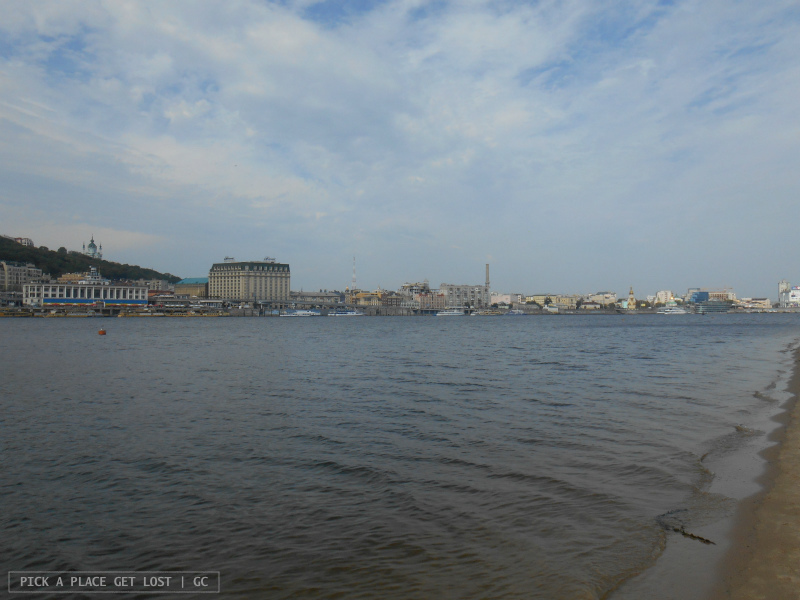 The second time we were standing by the Monument to the Founders of Kiev on the river bank (see entry no. 9), when we caught a glimpse of the statue sticking out of the thick vegetation on the hill. Third time’s a charm, though, or so they say, and that’s when we managed to see the statue in its entirety. The 62-metre-tall monument stands atop the Museum of the Great Patriotic War, or, as it was recently renamed, Museum of the History of Ukraine in the Second World War*. It portrays a female warrior with her arms stretched out, a sword in the right hand and a shield with the Soviet symbol (the sickle and the hammer) in the left hand. You might find that the sword is disproportionate to the overall size of the statue. Well, that’s because the tip was literally cut, so as to make sure that the sculpture wouldn’t be taller than the Lavra. The monument looks solemn and belittling, although this fun fact possibly makes it just slightly less so. The statue, the museum and the whole site celebrate the Soviet victory over Nazi Germany and honour the soldiers that fought in defence of Kiev during the war. Needless to say, the overall design of the complex complies with the standards of Soviet brutalist architecture. The site was opened in 1981 and it is huge. In fact, it’s one of the largest in the country. Apart from the museum itself, it includes a large outdoor display of objects and equipment: tanks and military armaments, commemorative sculpture groups, the Memorial hall (where the names of those who were honoured during the war), and the Fire of Glory, a large ‘bowl’ with the burning eternal flame. * As I mentioned in the second post about Moscow, the label ‘Great Patriotic War’ identifies the conflict between German and Soviet forces, which broke out after Germany invaded Soviet Union. 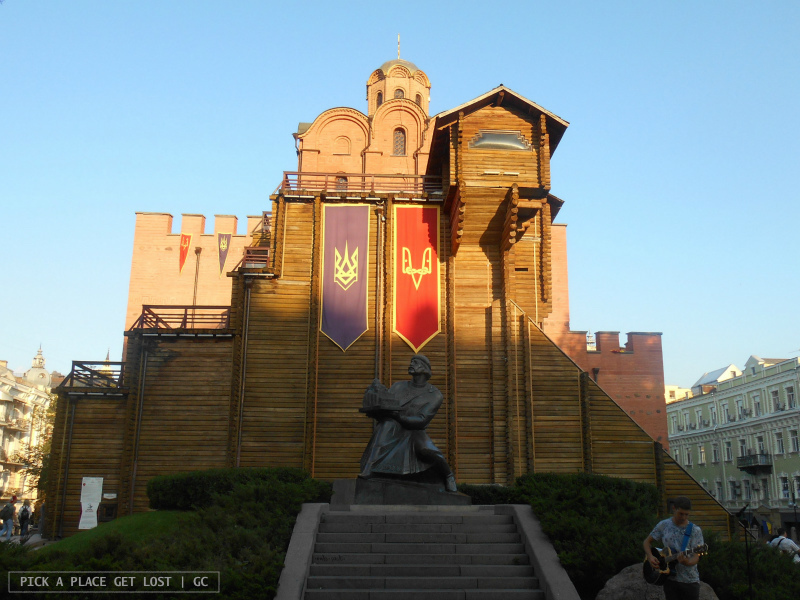 The Kiev museum was renamed in 2015, when the Ukrainian Parliament outlawed the label ‘Great Patriotic War’. In spite of that, the old name is still largely used to identify the museum. With the visit around the museum site -and a timely, (even too) generous downpour of rain- our time in Kiev came to an end. It was dense and intense, both in terms of city sightseeing and ‘thanks to’ the visit to the Exclusion Zone, but it was hugely interesting and fascinating. And Kiev was only the beginning. Get ready for the next Ukraine posts, respectively on Odessa, Lviv and Uzhhorod! 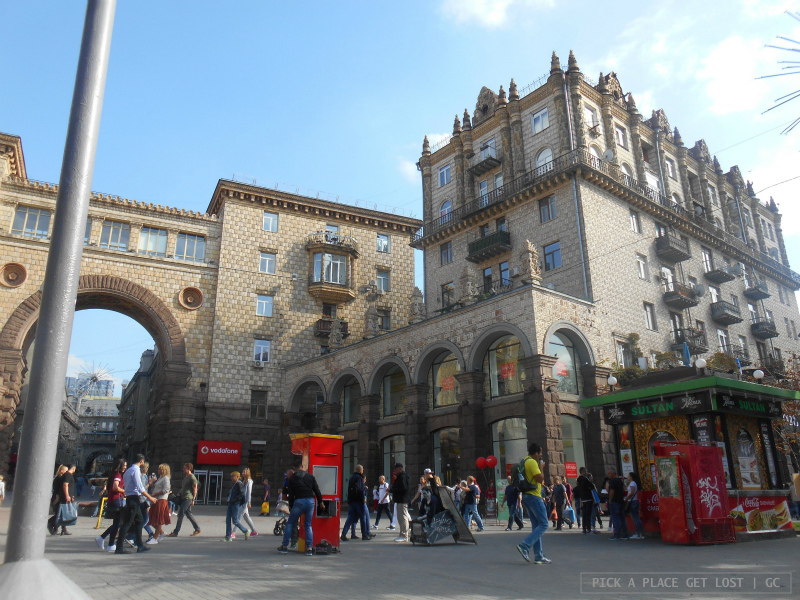 This entry was posted in Ukraine, Ukraine 2017 and tagged kiev, kiev city, kiev sightseeing, ukraine, ukraine tour by Giorgia. Bookmark the permalink.